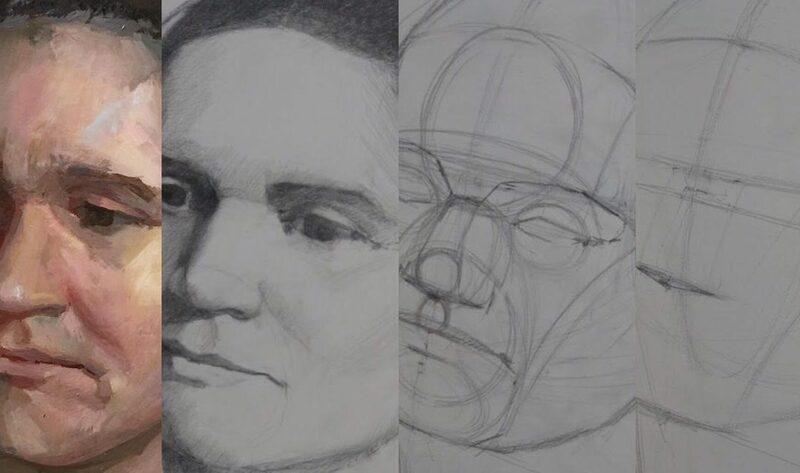 In this class we learn how to construct drawings of the human head and face at many angles by drawing basic shapes. Later we’ll apply those abstractions to rendering specific people. We take the time to understand heads and features in general so you’ll be able to draw portraits faster and with less difficulty over time. This is especially useful for students interested in drawing from imagination and for illustration. Students currently enrolled in any portrait painting from life can be benefit by understanding heads in the ways we will practice; it’s the boot camp of portraiture. We will be working from photographs for reference. Students may be asked for more specific items as the class progresses. Smaller sketch pad for your lap, or desk. We will use more materials and paints but that will be discussed in class. You won’t need them the first few classes. You may choose not to paint.